Tai Chi Chuan is a well known complete body and mind health system. It is also a very effective internal martial art literally translated as Supreme Ultimate Boxing. Practising Tai Chi Chuan helps to improve health, promote longevity and enhance vitality. When practiced correctly as an internal martial art, Tai Chi Chuan can cultivate abundance of internal energy (Chi) and develop internal strength and power (Jin). However, many people find the development of internal strength difficult to achieve even after many years of diligent practice. This is due to lack of information and guidance on correct practice. Grandmaster Yang Cheng Fu correctly put “Tai Chi Chuan without internal strength is not true Tai Chi Chuan”. Are you enjoying the pink of health? Are you developing enough of Chi? Is your Tai Chi Chuan packed with strong internal strength? Can you emit powerful internal force at will? At last! The long awaited book is here, written by Master Hiu based on his more than 25 years of diligent practice and experience in Tai Chi Chuan. This book reveals the Internal Secrets of Tai Chi Chuan. It shows you how to cultivate abundant of Chi naturally. It shares hidden methods to build strong internal strength and it provides training guides to manifesting internal force. This book also gives you a rare glimpse into the secret self defence application of Tai Chi Chuan and much more. 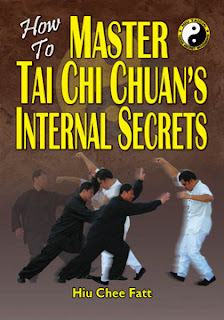 Now you too can learn the internal secrets of Tai Chi Chuan and train your way to mastery. Instructors will find this book very useful as an alternative reference material for students. Advanced students will find information in this book invaluable in helping them advance further into the development of internal skills and novices can use this book as a guide to correct practice. Due to overwhelming respond to the book we will continue to offer a 20% DISCOUNT on the retail price of the book (USD28.00) while stock last. Therefore, Get One Now at USD22.40!